One of my pursuits outside of the never-ending task of compiling this history of the Stanaway family is as a volunteer crew member with the Coastguard, in fact the Kaipara Coastguard based out of Helensville. The area covered is on the West Coast from as far north as Hokianga down to Manukau Heads plus 12 miles out to sea. This means travelling over the Captain’s old stamping ground of the Kaipara Bar. The Bar is nice on a good day and very nasty on a bad one. With apt names such as “the graveyard” laying testament to a time when entering and exiting the Kaipara was more about good navigation, the right tide and wind and a good dollop of luck. We know John James improved his luck by placing bearing buoys but this was only after some years already operating as the pilot, shortly after the buoys were washed away in the first big storm. Crossing the bar takes skill and knowledge, we offer courses and practical experience in safely navigating your way in through the harbour entrance, but back in the 1850’s the responsibility lay with one man Captain John James Stanaway. Perhaps it was by chance or good fortune that John James did not meet an untimely end on one of his many crossing. I would suggest it was more to do with his skill and local knowledge. To think he also had the lives of at least three of his children in his hands who were members of his crew, shows a great deal of confidence in his ability. We know that in 1855 he did loose “The Star of the East”. The vessel had waited a full month for the right conditions to exit the harbour, on three separate occasions they tried but conditions changed and they returned. On the fourth and final attempt they were half way out when the wind dropped John tried to head for another channel but they were washed into the breakers. John and 21 crew were lucky to escape with their lives, the vessel soon disappeared under the breakers. Over 150 years later we have aluminium boats, with twin 225 outboard motors, radar, GPS, safety suits, life jackets, radios, cell phones, beacons and helicopters to assist in both navigating and staying alive in the worst possible conditions. Even with all this equipment it is still four men in a boat taking on a bar crossing with upto 12m waves and a blustery south-wester. Finally a plug for the Coastguard, if you are a boatie become a member, and/or if you see volunteers out selling raffle tickets buy a bunch of them. This entry was posted in Uncategorized and tagged Coastguard, Kaipara, New Zealand, Pilot, Stanaway on March 16, 2016 by gregorypaulskinner. Over this last weekend I happened to jump onto the John James Stanaway Facebook page, which Wendy set up a few years back for the revised edition of the Tides of Time (check it out if you have not visited the site yet – there is a link to the page on our Home page). When going through the latest correspondence I can across two messages from a descendant of Harriet Clark (Sarah Clark’s sister-in-law – Harriet married George Clark). Both messages had portraits attached to them and a note stating that they were found inside Harriet Clark’s Family Photo album. The first message contained a picture of Elizabeth Heath Clarke as a young girl with either Laura or Phoebe Stanaway sitting in a chair next to her (see link to Elizabeth’s page). 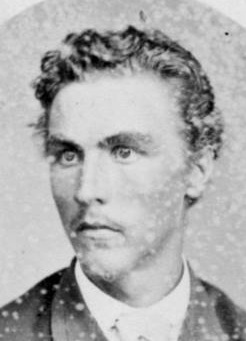 The second message had a copy of a portrait of a young man, which had a note written next it stating “probably William Stanaway”. 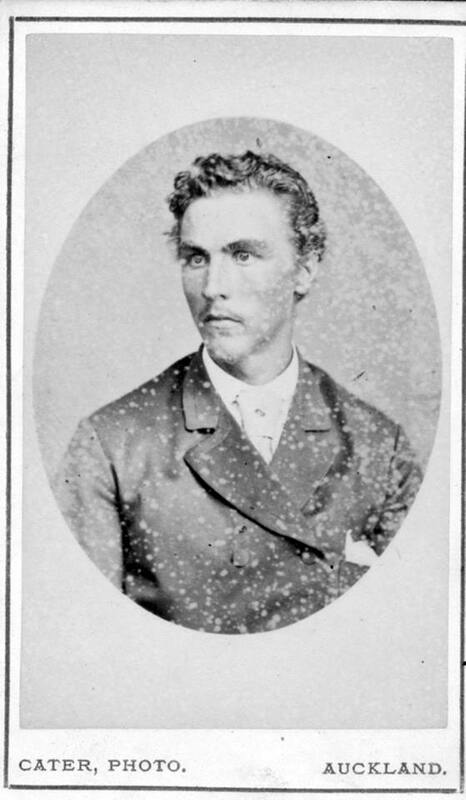 Portrait from Harriet Clark’s Photo Album stating “probably William Stanaway”. I am endeavouring to contact the author of the message to get further details and perhaps arrange a meeting. In the mean time we can only speculate if this is in fact William Stanaway. We do have two William Stanaway’s – a father and son at this period of time – so potentially it could be either. The first is William Henry Stanaway (1843-1916). We will call him William snr. We have one confirmed portrait of William snr which is of an older man and taken sometime in around 1905-1915. We also have another portrait of a younger man perhaps in his mid to late 30’s (although if is also though this could be of his son William). We have lined these portraits up at the bottom of this post – there are some similarities in the cheek bone, jaw and foreheads. I do wonder if this portrait is part of a set, and is in fact a portrait of William at the time of his wedding in 1871 (he was 28 years old), and that there could well be a portrait of his wife of similar size in the Harriet Clark album (Note Sarah, when she remarried after JJ’s death had similar portraits taken of her and her new husband). 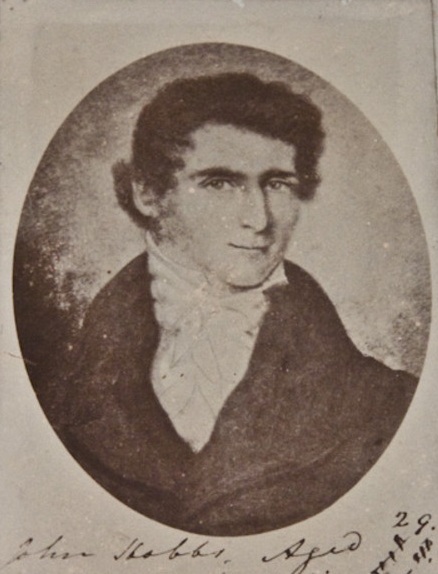 I could understand that a portrait of William snr could appear in the Clark album as he was working with his father as well as he was living at Tokatoka and would have had may dealings with his step mothers family. The second is William is William Alfred Stanaway (1875-1900) the son of William Henry Stanaway – we will call him William jnr. We do not have any pictures of this William, he died in a fire at the Aratapu lock up, aged just 25. The age of the man could fit as he looks to be out of his teens but not yet into his 30’s. 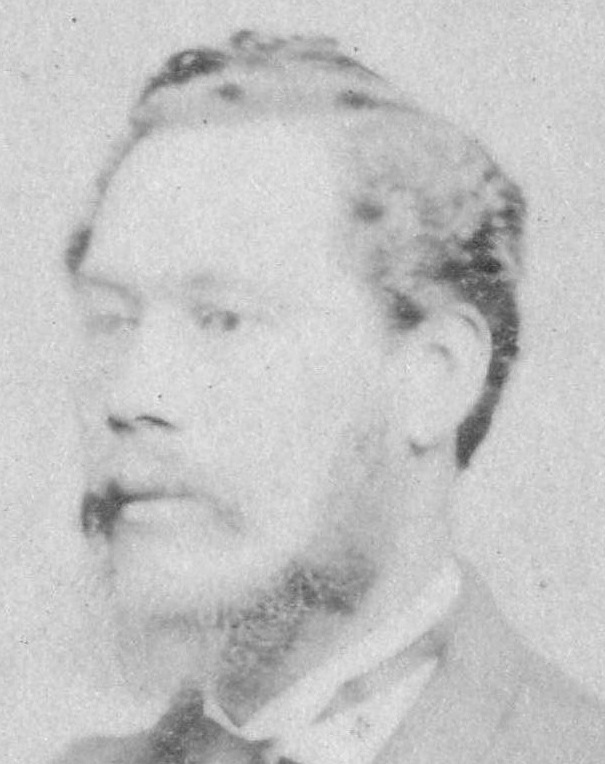 I think it maybe a stretch that Harriet Clark would have a portrait of William jnr in her album as from the age of the subject, William snr and his family had moved to the opposite side of the river and that JJ would have died some years before contact may have been less and less particularly a to a sister-in-law of a step mother. Of these portraits the left is the portrait found in Harriet Clark’s album, the middle is thought to be William snr (but could be William jnr) and the portrait on the right is confirmed to be that of William snr. This entry was posted in Uncategorized and tagged Family Connections, Kaipara, Stanaway, William Stanaway on March 15, 2016 by gregorypaulskinner. I recently completed reading the above mentioned book which is the personal recollections of the author’s life in the district from 1884 until the writing of this book in 1952. While most of the book centers around his working life which was in milling and the shipping of timber he does mention and go into history of the area and early settlers and their deeds. 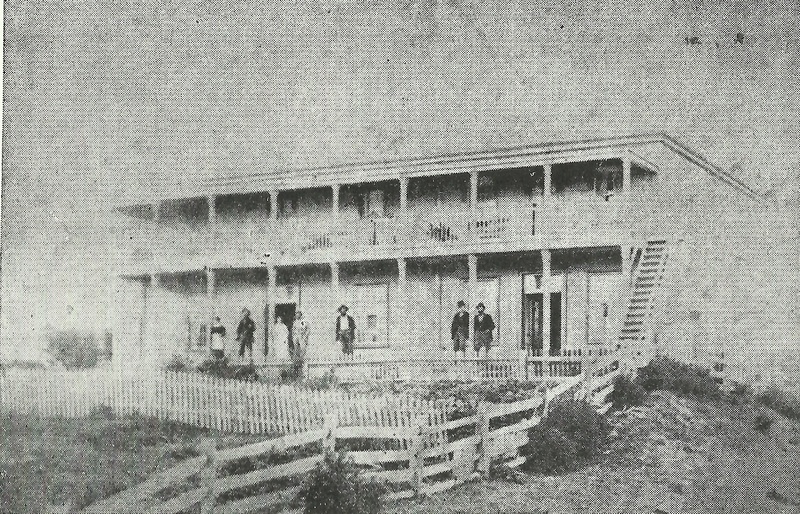 The second “Kaipara Hotel” shortly before it was burnt to the ground. You will find a fine picture of the (second) “Kaipara Hotel”. The first was built about 1866 by Ihapere (Isabella) Nelson (nee Stanaway) and her husband Charles Nelson, they ran the hotel for a short period then leased it to others to run and manage. It was burnt to the ground in 1868, at total loss to the lessee. They then rebuilt the second “Kaipara Hotel” and leased it out again. By 1873 they had sold the hotel. (Note – Both Charles Nelson and John James Stanaway appear in the annual lists for Bush Licenses throughout the 1860’s and early 1870’s in the Kaipara district). The fate of the second hotel was that It was burnt to the ground in January 1884, with the loss of two lives and never rebuilt. Also a picture of the schooner “Lotus” being built at Whakatiwai, on which Charles Nelson helped design and his brother in-law Henry Stanaway was an apprentice in the construction. Some of the oldest houses are there (South end of the town) … and J.C Taylor’s house by the big Norfolk pine. It was built by a Norwegian interpreter named Neilson, who married Captain James Stanaway’s daughter Bella. Nelson Street at the north end of the town was named after him. On page 24 is mentioned the wreck of the “Rona” in 1880 to which Henry Stanaway searched for. Henry found what appeared to be the remains of the wreck only to discover that it was an earlier wreck together with and the remains of one of its unfortunate crew. 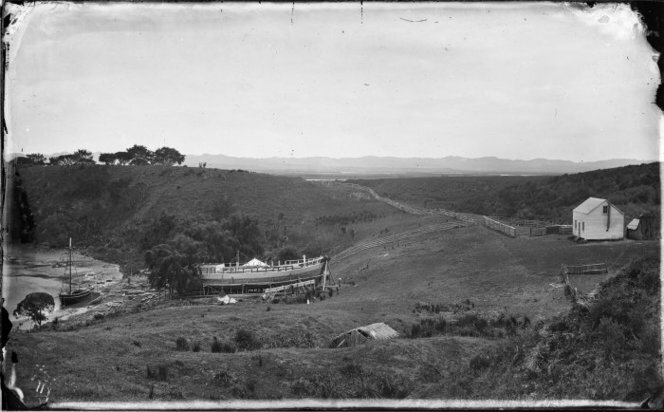 From his knowledge of the Kaipara bar he suggested on numerous occasions for the search of the “Rona” to start on the North Head and not the South Head, he was not listened too. Only to be proven to be correct a number of months later when the wreck of the “Rona” was eventually found on the North Head together with the crew of 4, all drowned. Captain James Stanaway was the earliest pilot for the Kaipara bar. He had a lifeboat, and with a crew pulled out over the bar, boarded vessels and guided them in. When his half-caste boys Henry and William were old enough, they went with him as crew. Henry married Rose McElroy from Ireland, they had ten children who were brought up and went to school in Helensville. There are only two of that generation left, but more of the next. William married a Maori woman and also had children that went to Helensville school but are scattered now. Bella Stanaway, daughter of Captain James, married a Norwegian named Neilson and lived in the house occupied by J.C Taylor, the storekeeper by the big Norfolk pine.They had a son who was an auctioneer for the North Auckland Farmers’ Company. 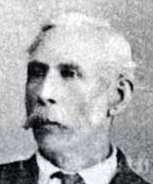 Captain James Stanaway later married a white woman who had some children. After his death she married again and had some more children. There are quite a number of half-caste and white descendants still in the district and making good citizens. In the later part of his life he kept the old two-storied wooden hotel at Tokatoka. It was burned down and a new one built by the highway near the river. The Foresters’ Hall and Stanaway’s store in 1920. This entry was posted in Uncategorized and tagged Charles Nelson, Charles Staniland West, Helensville, Ihapere Nelson, Ihapere Stanaway, Kaipara Hotel, Lotus, Nelson, Stanaway on March 13, 2016 by gregorypaulskinner.